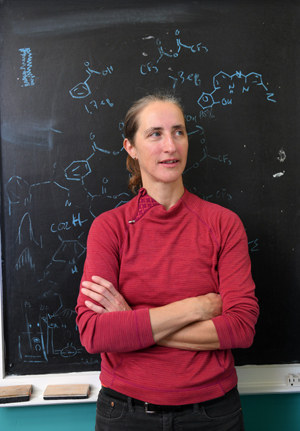 In a field where women are often underrepresented, Alison Thompson has distinguished herself as an outstanding mentor for aspiring organic chemists through her supportive approach to teaching in the classroom and her work as a graduate student supervisor. 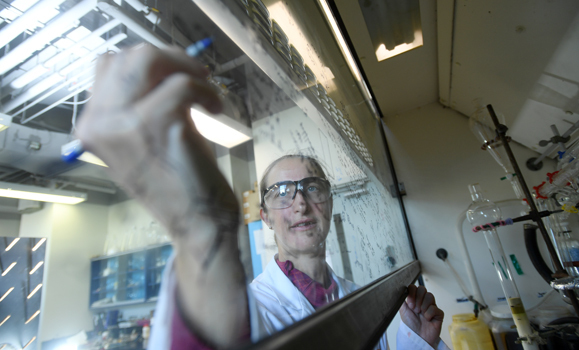 In recognition of her work, the Faculty of Science Killam Professor in Dal’s Department of Chemistry received two of the university’s prestigious teaching awards this year: the Dalhousie Alumni Award of Excellence for Teaching (the university’s top teaching award) and the Award for Excellence in Graduate Supervision. Dr. Thompson teaches organic chemistry, a topic that can draw classes of more than 300 students. To assist her students in navigating the topic, she has created several supplementary materials, including eResorganic, an online collection of videos that provides students with step-by-step instructions on how to solve organic chemistry problems. Dr. Alison is also a pioneer in the use of tablets for teaching in the classroom at Dal. “She used tablet technology to incorporate chemical drawings and reactions in all aspects of her lecture materials. This method of lecturing proved beneficial to me and others,” wrote one previous student in support of Dr. Thompson’s nomination, noting her lectures were conducted differently than most. These days, since switching to an iPad, she enjoys the support of her students who are eager to show her the interesting features of the device or recommend better note-taking apps. Dr. Thompson’s awards recognize her outstanding ability to effectively communicate complex course materials and successfully mentor graduate students through their academic experience. The path to this point in her career hasn’t always been easy, though. “I am a person who stutters, so until I found a therapy that worked for me, life was not as lively as today,” she says. Now, she facilitates the Halifax Support Group for People Who Stutter — a group that provides safe space for people with speech impediments to share their experiences and discuss topical issues. 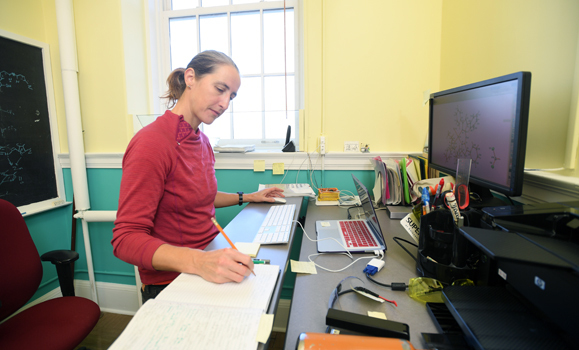 Dr. Thompson’s field, like many scientific disciplines, lacks diversity. Tabitha Wood, a previous graduate student of Dr. Thompson, described her as an “excellent role model” for young female scientists. Dr. Thompson says she is always pleased to run into her students outside of class.